This fine lady here is actually not my daughter but my fiance. She wanted to be Pocahontas but didn’t want me to be her John Smith because his costume would be too plain and boring so we went with being her dad, Chief Powhatan, instead (haha). Chief Powhatan was pretty simple to make. The headgear was made from red felt paper and feathers bought from Hobby Lobby. The bottom was just a tan colored fabric cut into the general shape of his outfit and lined with more felt paper making the frills and belt. The fur wrapping around the shoulders were sewn onto another piece of fabric to make the cape and all that was bought from Hobby Lobby as well. The Pocahontas dress was custom cut and sewn from fleece fabric material. Her necklace was made entirely out of felt paper. The white stone pendent was stuffed with cotton to add dimension to me. White felt paper was used to make the trimmings. Top it off with a skinny belt and paint on the arm tattoo and you have yourself a good looking Native American princess! 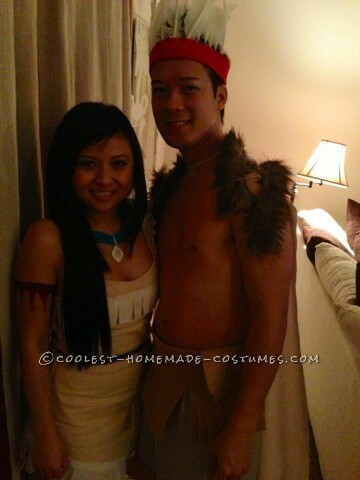 Our friends thought it was silly why we chose to go as the Chief and Pocahontas and not John Smith and Pocahontas but they loved it and we had a great time making the costumes!